Updated August 25: Google has confirmed that YouTube Gaming will be launching tomorrow, August 26, according to The Next Web. It will be available on the web, as well as on iOS and Android, and while it will only roll out to the UK and US at launch, it is expected to eventually makes its way to wherever YouTube currently is available. Meet YouTube Gaming, Google's answer to live-streaming leader Twitch. Coming this summer, YouTube Gaming is an app and website built for gamers. It's clear Google is capitalizing on the success of ultra-popular YouTubers like Pewdiepie, who specializes in "Let's play" and walkthrough videos. YouTube Gaming's Twitter description is even, "Let's play." The new division of YouTube tweeted, "We're connecting you to the games, community and culture that matter to you - by gamers, for gamers." With the service, folks can "hang out with [their] favorite YouTube Creators in our new Live system." Once you've subscribed to a channel, you'll be notified when a live stream is beginning so you don't have to miss any of the action. According to Google, YouTube Gaming is made exclusively for games and gamers, noting "when you search 'call', you'll end up with Call of Duty, not Call Me Maybe." The company revealed that over 25,000 games will each have their own page and make it much simpler for gamers to connect with their favorite YouTubers. Google says that in addition to existing features like 60fps streaming and converting streams into YouTube videos, the site is going to make launching a live event possible with no prior scheduling, making surprise live streams and reveals an easier task. 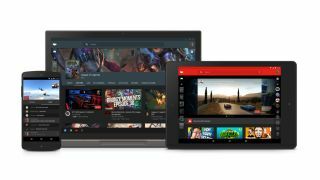 YouTube Gaming will arrive this summer, starting in the UK and the US, and the team will have a booth at E3 2015 showcasing some of its new features.